Frequently Asked Questions - Luce Puppet Co.
What should I know about your show? We perform on a colorful, portable puppet stage which stands seven feet high by five feet square. The stage travels with a sound system, sets, curtains and lights. The show takes place about five feet off the ground, so everyone has a ringside seat. What does a Luce Puppet Co. show cost? What do you need provided in order to perform? We arrive at least a half hour in advance to set up, and will need to have access to a power outlet. For larger events, and where a larger sound system is required, a little more time is usually necessary. We need enough space for our stage and your audience. Yes, if the conditions are ideal. This means no soggy ground, bad weather, or strong winds. The stage needs an even area to set up in. The audience should be seated in the shade and not have the sun directly in their eyes. Also, consider giving them pillows or blankets to sit on if the ground is rough -it will help them enjoy the show! We have portable power for outdoor shows. What ages are your shows geared for? 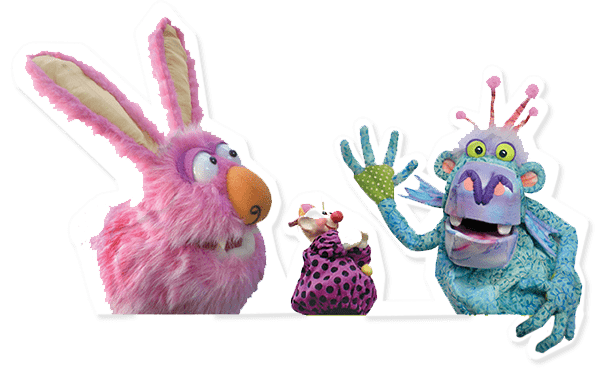 We find the shows are most appropriate for children ages three through eleven, but there is lots of humor and fun that appeals to the entire family. Children as young as two may also enjoy the shows if their older siblings or preschool classes are also present and watching. What is the show length? Each show is about 35 minutes in length, which we find is the perfect length for children in this age group. For library and assembly shows (we do use our judgement), we partially dismantle the stage at the end of the performance so the kids can see the inner working of what it takes to make a show happen. With the puppet demonstration, and questions and answers, the whole presentation usually lasts 45 minutes or longer. How big are the puppets? The puppets in various productions average in size from fourteen to twenty inches, and since the stage area is about eye level to a standing adult, the puppets are easily visible to even large audiences. Floor seating for the children at the front, with chair seating for adults in the back, will maximize everyone’s visibility. We perform just about everywhere – libraries, art fairs, festivals, school assemblies, corporate picnics and events, country clubs, department stores, malls, family parties and many other venues. How about birthday parties and puppet shows? Puppet shows are great for birthday parties! Serve the cake and ice cream after the show though, so the kids are in a good sit-down mood for the show. Yes, we occasionally have workshops on design and building. These workshops are generally for adults, or young adults and older students, who are already involved in the arts, or have interest in art or performance. Building workshops will also require a materials fee in addition to the usual fee. Do you build puppets for others? Yes, we build professional puppets for video and theater and other uses, also large walk-around and theme costumes. Elizabeth is available as a designer of both of puppets and costumes.